Aboot 100 km frae its soorce, the Tigris enables rich agricultur ootside Diyarbakır, Turkey. 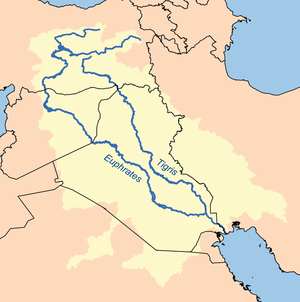 The Tigris River (/ˈtaɪɡrɪs/) is the eastren member o the twa great rivers that define Mesopotamie, the ither bein the Euphrates. The river flaws sooth frae the muntains o sootheastren Turkey through Iraq. The Tigris is 1,850 km lang, risin in the Taurus Muntains o eastren Turkey aboot 25 km sootheast o the ceety o Elazig an aboot 30 km frae the heidwatters o the Euphrates. The river then flaws for 400 km through Turkish territory afore acomin the border atween Sirie an Turkey. This stretch o 44 km is the only pairt o the river that is locatit in Sirie. The remainin 1,418 km are entirely within Iraq. The Tigris unites wi the Euphrates near Basra, an frae this junction tae the Persian Gulf the mass o movin watter is kent as the Shatt-al-Arab. Accordin tae Pliny an ither auncient historians, the Euphrates originally haed its ootlet intae the sea separate frae that o the Tigris. Baghdad, the caipital o Iraq, staunds on the banks o the Tigris. The port ceety o Basra straddles the Shatt al-Arab. In auncient times, mony o the great ceeties o Mesopotamie stuid on or near the Tigris, drawin watter frae it tae irrigate the ceevilization o the Sumerians. Notable Tigris-side ceeties includit Ninawa, Ctesiphon, an Seleucia, while the ceety o Lagash wis irrigatit bi the Tigris via a canal dug aroond 2400 BC. ↑ 1.0 1.1 Isaev, V.A. ; Mikhailova, M.V. (2009). "The hydrology, evolution, and hydrological regime of the mouth area of the Shatt al-Arab River". Water Resources. 36 (4): 380–395. doi:10.1134/S0097807809040022.